Winter care of trees and shrubs is an important consideration in cold regions. Shade trees, ornamental shrubs and evergreens are the biggest plant investments you’ll make for your garden. If you live in a cold-weather zone, you know that winter can be hard on garden plants. Here are tips for protecting your valuable woody plants. Watering: Good winter care starts with thorough watering in the fall. When the garden season draws to a close, it is tempting to just forget about your plants. However you should continue to water all woody plants – especially newly planted trees and shrubs and all evergreens in the fall. Water them well until the ground freezes, and make sure you water adequately through a dry fall. Evergreens and broadleaf evergreens don’t lose their leaves, so they need a good store of moisture going into winter because they continue to transpire (give off water vapor) through the cold months. Most winter damage to evergreens doesn’t actually come from cold, but from the drying effects of late winter sun and wind. With the soil frozen hard, plant roots can’t take up water to make up for moisture losses from transpiration and, as a result, dehydration can cause browning or burning of foliage. 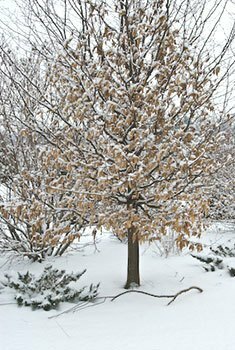 Winter care of trees and shrubs: To wrap or not? Personally, when considering winter care of trees and shrubs, I don’t go crazy with burlap wrap. It’s extra work and doesn’t look great. 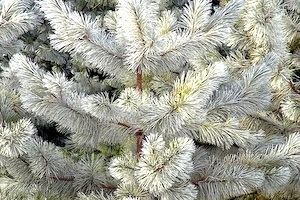 After all, the whole point of evergreens is to give you something green that’s attractive through the winter. Contrary to popular belief, most established evergreens hardy in your region don’t need to be wrapped. However, as with many things in gardening, there are exceptions. Some evergreens, such as dwarf Alberta spruce, are prone to winter-burn, so they should be covered, as should newly planted evergreens. New plants haven’t had time grow extensive roots that help them take up enough moisture to prevent excessive water losses. If your plants get salt spray from the road, burlap may help, but wrap them with a double layer, not a single layer. To avoid having to cover your evergreens, don’t plant them near a road that gets salted, or plant salt-tolerant species such as junipers. Protect broadleaf evergreens such as rhododendron, pieris and laurel from the drying effects of winter sun and wind with an anti-desiccant spray such as Wilt-Pruf, which coats foliage with a protective waxy film. You can also wrap with burlap, if you must. To help preserve moisture, cover the root area of evergreens and broadleaf evergreens with a three-inch thick layer of leaf or bark mulch. Protect upright evergreen junipers and cedars from breakage due to ice and snow by wrapping branches with heavy string or mesh covers sold for this purpose. Once fastened into place, you’ll hardly see the string or mesh. Protect young trees by putting plastic tree guards around the bottom of their trunks to prevent damage from gnawers such as rabbits and mice. Make sure the tree guards go high enough – over the snow line. Always remove them in the spring because it looks better and you don’t have the problem of the guards trapping moisture against the bark in the summer and attracting insects. If rabbits are a big problem in your area, winter care of trees and shrubs should include putting chicken wire cages around the plants they find most tasty. Prevent rabbit and rodent damage with a pest repellent spray that you apply on lower trunks, branches and stems. Such products generally have to be reapplied after wet weather.